during this time of the year, movies are usually in a little bit of a lull. we are in the middle of awards season and january/february are well known to be not great movie months. you’ll see lots of re-screening of movies that are nominated for an oscar as well as random valentine’s day movies and a handful of others. anyone who knows me well knows i am big movie fan and going to the theatre is something i enjoy doing on my days off from work. there are a whole list of pet peeves that i don’t like at the theatre, but that’s for another day. when i go, i make every attempt to get to a screening before noon. 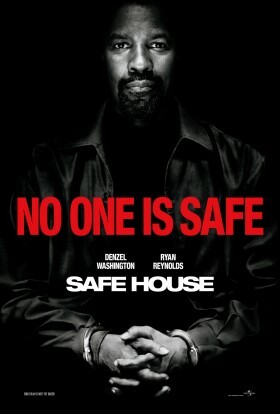 matinee prices are always much more affordable, so yesterday i found myself at an 11 am showing of Safe House. from the picture to the left, you know that the film stars denzel washington, but it also stars ryan reynolds. reynolds isn’t really known for his action roles although he has played several lately. everyone remembers him from van wilder and other comedies and romantic comedies but he’s been acting since the early ’90s if you didn’t know. everyone knows denzel. brendan gleeson also plays a nice supporting role in the movies as well. anyway, with all that being said, i enjoyed this action packed movie. the premise is that a former CIA agent is being chased by bad guys and ends up going back to a US consulate even though he has sold US secrets to the enemy over the years. once he gets to the CIA safe house, the chase ensues as the same bad guys come after him. the CIA housekeeper, matt weston, who is a young inexperienced agent does his best to keep him safe and bring him in. the back drop of the movie is mostly in cape town, south africa, which made for several very exciting car chase scenes. the gritty city streets were busy and crowded with lots of cars and bystanders. it seemed like it was an every day occurance and many of them didn’t flinch and just went the other way. i can only assume it is something like that in that part of africa normally, but don’t know for sure. nonetheless, it made for a nice background scene for the film. as the movie progresses, denzel’s character, tobin frost, makes weston question what he knows about the CIA and how the enemy found them to begin with. when frost escapes from weston, weston works to recover him even as CIA headquarters tells him to stand down. the movie ends with a few twists as you might guess and alot of bullets flying around. overall, as i said, i enjoyed the movie and would certainly watch it again. as for a rating, i would say a solid B to B+. nicely done review. I liked it too. The rather new setting/location of Cape Town and environs – you don’t see that every day. And Reynolds did step up. The film is pre-sold on Washington’s name on the marquee – so as long as they don’t completely blow it up – it should do decent box-office. it was a new and different location. good to see it wasn’t more of the same. and thanks for reading!